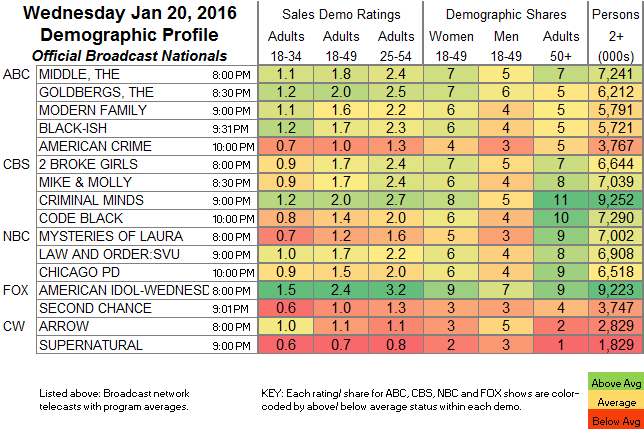 NETWORK UPDATE: MIKE & MOLLY gained 0.1 in final numbers. CABLE HIGHLIGHTS: ESPN’s Golden State vs. Chicago NBA game took the Wednesday cable crown with 0.84; the late Atlanta vs. Portland game was at 0.50. Otherwise, it was A&E’s night, as the two-episode premieres of DUCK DYNASTY (0.79/0.76) and JEP & JESSICA (0.73/0.62) took the #2-5 slots. VH1’s MOB WIVES dropped 0.09 to 0.58 in its post-season premiere week. MTV’s THE CHALLENGE gained 0.04 to 0.56. 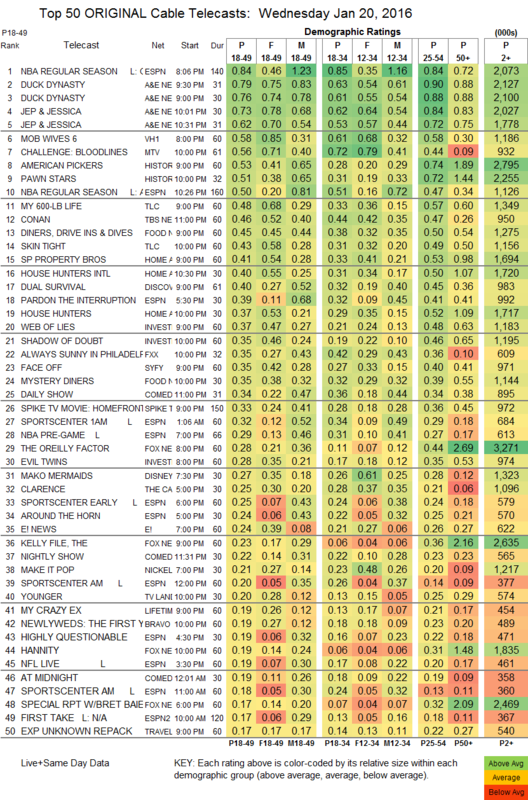 On History, AMERICAN PICKERS lost 0.04 to 0.53, and PAWN STARS dropped 0.09 to 0.51. TLC’s MY 600-LB LIFE gained 0.02 to 0.48, and SKIN TIGHT ticked down to 0.43. On Food Network, DINERS DRIVE-INS & DIVES was at 0.45, and MYSTERY DINERS was at 0.35. On HGTV, PROPERTY BROS lost 0.04 to 0.41, HOUSE HUNTERS INTL shed 0.02 to 0.40, and HOUSE HUNTERS was down 0.08 to 0.37. Discovery’s DUAL SURVIVAL dropped a hundredth to 0.40. On FXX, IT’S ALWAYS SUNNY IN PHILADELPHIA rose 0.03 to 0.35, and MAN SEEKING WOMAN lost a tick to 0.14. Syfy’s FACE OFF was up 0.01 from its season premiere to 0.35. After a multiplatform launch last week, YOUNGER and TEACHERS aired only on TV Land. Strictly on TV Land, YOUNGER was up 0.03 to 0.20, although the 2-network total last week was 0.35. As for TEACHERS, it was up 0.05 from last week’s TV Land score to 0.14, but last week’s 2-network rating was 0.28. Bravo’s NEWLYWEDS: THE FIRST YEAR rose 0.04 to 0.19. FYI’s KOCKTAILS WITH KHLOE was at 0.16. Tru’s BILLY ON THE STREET fell 0.01 to 0.07. with another episode at 0.06.